The power that art possesses is its ability to change ugliness into beauty, and to provide comfort after defeat. Hany Abu-Assad, the Palestinian director whose acclaimed features Paradise Now (2005) and Omar (2013) each earned Oscar nominations for Best Foreign Language Film, considers The Idol his third in a series of Palestine-set pictures. Though The Idol is as compelling as his previous work, it is destined to reach an even wider audience with its boundless warmth and crowd-pleasing appeal. 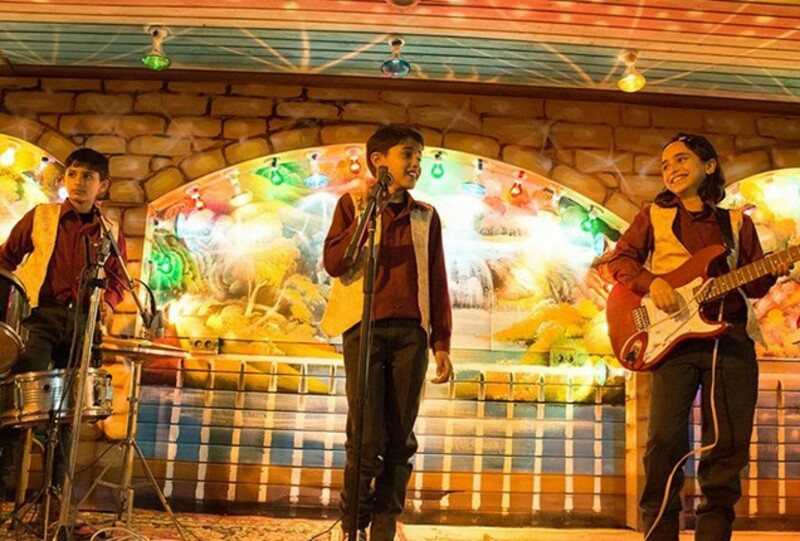 The story of Mohammed Assaf, a pop singer from the Gaza Strip, is so improbable and uplifting that you’d swear a Hollywood studio had conceived of it as a sort of Middle Eastern spin on Slumdog Millionaire. But Assaf’s tale is indeed a real one, and his triumph on the second season of Arab Idol united everyone who saw it in a shared sense of exhilaration. It tells of talented teenage singer Mohammed Assaf (Tawfeek Barhom), who travels from the Gaza Strip to Egypt to audition for the television show Arab Idol. This is a feel-good movie which gives a human voice to the Palestinian dilemma without being political or religious. It’s pure heart. 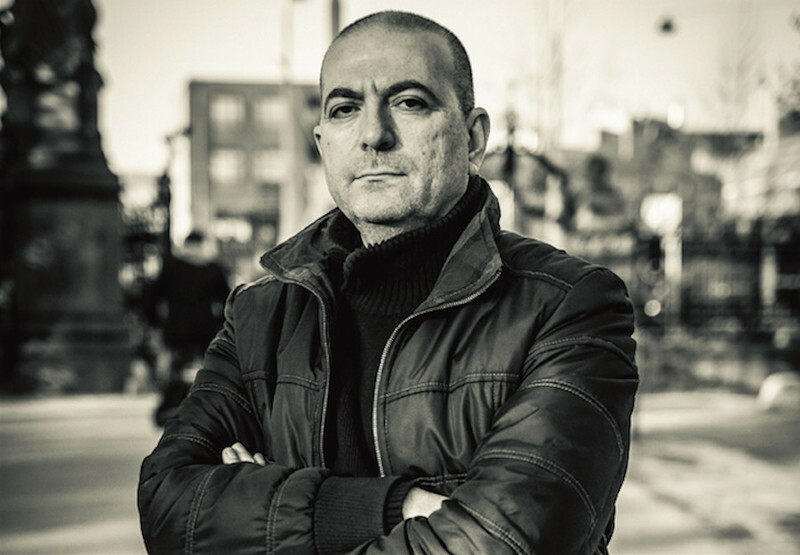 The original script was written by Sameh Zoabi whose earlier film, Man Without a Cell Phone won the Montpellier Mediterranean Film Festival Award for Sameh as Best Director. Hany Abu-Assad talks about The Idol at a press conference. What inspired you about the life and music of Mohammed Assaf? Politicians nowadays try to separate people from each other. Look at how the candidates in the current [U.S.] campaign are trying to polarize voters. Whether it be a concert of Pink Floyd or Lady Gaga, or a movie like “Spotlight” or “A Separation,” art can connect people and let them share the same experiences. I saw people in Palestine—rich and poor, Muslims and Christians, religious and nonreligious—enjoying Mohammed’s music in those big squares where they came to hear his voice. We are always fighting each other in the Middle East, with Israeli and Palestinian politicians inciting us to hate each other. Music and art are what bring you together. I looked at those people and thought, “This is the power of art.” I wanted to make the film a love letter first of all to Gaza and second of all, to the power of art. I’ve been in the movie business for twenty years, and I needed someone from the outside like Mohammed Assaf to let me realize the power of art. 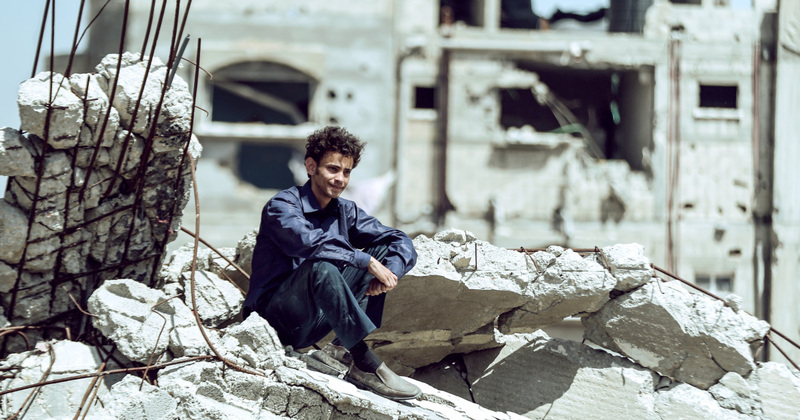 I love the scene where Mohammed sings in the car, and his song is juxtaposed against the crumbling buildings in Gaza. His voice seemed to be conveying the emotion of the landscape. Another power that art possesses is its ability to change ugliness into beauty, and to provide comfort after defeat. For example, when you lose your lover, what better comfort could you hope for than a good movie? The destruction in that scene is so ugly, but the music turns it into a painting. If you just showed the destruction by itself, you wouldn’t want to watch it. How was the singing performed in the film? Both actors couldn’t sing, so we had another boy singing instead of the boy who played young Mohammed. When the character is older, Mohammed Assaf himself sang the vocals. Was it difficult blending the archival footage with the scenes that you shot? Oh my god [laughs]. You mentioned [before the interview] that you liked screenwriting and editing, and in my opinion, those are the only enjoyable parts of moviemaking. Financing is hell, pre-production is stressful and shooting is one big mess. Writing is great because you get to go off and have your fantasy. Editing takes place after all of the emotions on-set, and it’s where you try to make sense of them. It’s a very enjoyable process. Mixing in the archival footage was so challenging, but it was so joyful too. We had fun putting the voice of Mohammed Assaf into the mouth of another actor. During the shoot, it was hell working with the playback. Your decision to cut to footage of the real Mohammed when the results are announced was particularly effective. I figured that there was no way I could film that moment any better. How did you approach working with the young actors? Hiba Atallah, who plays Mohammed’s sister, is the film’s life force during the first act, and she did a remarkable job. I cast these kids through Skype. I couldn’t go to Gaza for the casting, though the Israeli army later gave me permission to shoot there. Casting kids through Skype was a big gamble, so when they came on-set one day before the shoot, I was nervous. Everybody was nervous because we didn’t have the chance to rehearse with them or give them any kind of training. I think I am more lucky than anything, though perhaps I was good at choosing the kids. I know how to make actors comfortable. Any actor can become brilliant if he trusts the director and feels comfortable with the character. If you know how to do that as a director, then you have a good performance. I was lucky that the actors understood the process amazingly fast. On the first day, they asked me, “Uncle Hany, this scene is in the middle of the script, why are we filming it first?” I tried to explain to them how the scenes would be edited together later. After just one day, the kids even understood the difference between acting on-screen and off-screen. When they were acting behind the camera, they wouldn’t be doing their best, but when it was their turn for a close-up, they were really performing. I remember one day when the actor behind the camera made a mistake. He was supposed to stand in the middle of the scene so Hiba could look up. Otherwise it doesn’t make sense. He forgot because he wasn’t as alert behind the camera. She did not forget that he was supposed to stand, so she looked up [on cue] during the take. Even the most professional actor could forget to do that, but she did not. These kids were so smart that they not only understood the technique, but also what it meant to be emotionally naked. I told them that in order to do a scene, you must forget everything around you and you have to feel what the scene is conveying. If I’m telling you the scene is sad, you have to go deep into yourself and feel that sadness and don’t be afraid of it. They understood it, and I’m very lucky that they did. You are so skilled at crafting a sense of paranoia in your films that I often find my pulse racing before anything bad happens, such as when the military jeep pulls up behind Omar in Omar, or when Mohammed’s friend Omar materializes in the form of a menacing silhouette in The Idol. Those are very good examples. For the scene in “Omar,” you may write in the script, “Omar is walking down the road and a jeep approaches.” How do you shoot that in a suspenseful way? Suspense depends on the audience knowing what the characters don’t know. If the jeep appeared in front of Omar, there would be surprise, but not suspense. We would simply be sharing in Omar’s surprise. But what if Omar is walking and he has no idea that the jeep is closing in on him? The jeep must come from behind him, and you can do it all in one take. You don’t even have to cut to a reaction shot in order to feel the suspense. This is a trick that Hitchcock taught us: if two people are sitting at a table, and there is a bomb underneath the table, you must show the bomb to the audience, even though the characters are oblivious to it. If you don’t know that there is a bomb under the table, the conversation will be so boring. With the knowledge of the bomb, the scene suddenly becomes full of suspense. I think Hitchcock would’ve appreciated the last shot of “Paradise Now.” He loved focusing on a detail that everyone else is unaware of and is destined to change everything. Would you cite Hitchcock as an inspiration? What inspired your rather Hitchcockian cameo in “The Idol”? The actor who was supposed to do the role didn’t show up. He was a half-hour late, his mobile wasn’t on, and everyone was panicking. We had only two hours to shoot inside that location, so I decided that I would perform the role myself. I hated it. I don’t want to be like Hitchcock in front of the camera. How have the reactions of audiences been to the film? The film was shown in Gaza, on the West Bank, even in Israel, and has been shown all over at festivals in Holland, England and Canada. What’s so funny is that people would laugh at the same moments and be moved by the same moments no matter where the film screened. It’s powerful to observe how an Israeli audience will react the same way as a Palestinian audience. What are your thoughts regarding the blockbuster-saturated mainstream movie calendar in America? I consider it a domino effect. You make dumb movies and then the audience wants more dumb movies and so you make more dumb movies. Filmmakers are shooting themselves in the foot by hiding behind the notion that audiences want this sort of entertainment. It’s not true. They think the only way to keep audiences coming to the theaters is to spend a lot of money on explosions and special effects. It’s not about the story or the characters or the experience, just the special effects. We become circus-makers rather than filmmakers. It’s a circus, and it’s going to become very boring very soon to everybody. We’ve seen the same kind of explosions again and again. The talent will then go off and find much better work on television, while filmmakers will have destroyed their own industry by making the general taste of audiences more and more tasteless.